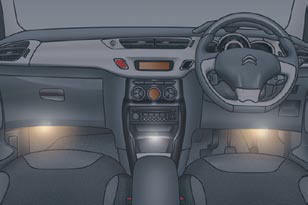 At night, the illumination of footwell and the central dashboard stoarge compartment comes on automatically when the sidelamps are switched on. 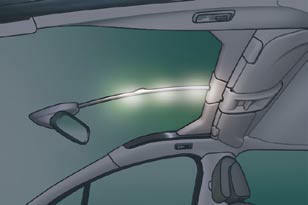 On certain versions, three lamps located in the support between the roof and the automatic day/night interior mirror come on as well. The ambience lighting switches off automatically when the sidelamps are switched off. It can be switched off manually using the instrument panel lighting rheostat button. With the lighting on, press several times on the left hand button of the instrument panel to progressively reduce the dashboard lighting level. Press again to reduce the lighting level to the minimum and switch off the ambience lighting.